G. I. 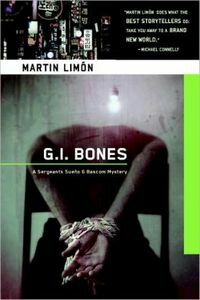 Bones by Martin Limón: Synopsis and Online Purchase Options. Synopsis (from the publisher): A Korean fortune-teller is being bothered by a dead American soldier who wants his bones found and buried. An underage officer's daughter is missing together with a Latino soldier. Several of the leading Korean gangsters who own the bars in the ville have been killed. Sueno and Bascom of Military Intelligence must go back to the founding of Itaewon, Seoul's red-light district, in order to learn who killed the soldier, who's taking revenge on the gang lords, and where to find the missing girl.